d i v e r s i t y w o m a n . c o m S p r i n g 2 0 1 8 D I V E R S I T Y W O M A N 23 journalism into management, but they still know a lot about how a newsroom runs and the public radio industry," she explains. "ey also have institutional knowledge I lack as a Utah transplant, so they can provide context for decisions made before I took on this role." Still, the generation gap—or at least its perception—and how it plays out in the workplace are real. A 2015 Harvard Busi- ness Review study of 65,000 millennial and baby boomer workplace leaders mea- sured both groups' perceptions of millen- nials across 49 leadership characteristics. A number of themes emerged. Negative perceptions of millennials: • Teammates often do not trust the ideas and opinions of younger, less experienced coworkers. • Younger workers have not been in the workplace long enough to have the requisite experience or deep knowl- edge. 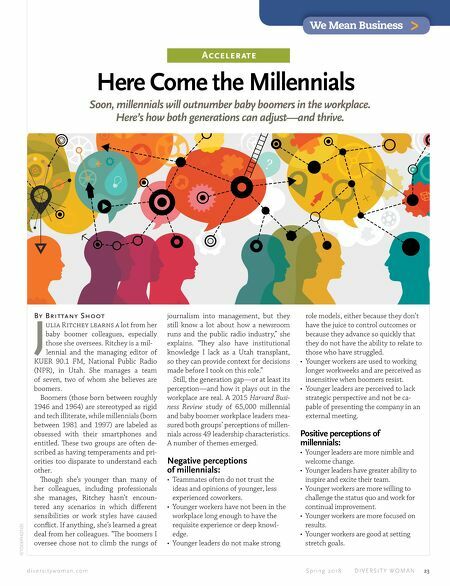 • Younger leaders do not make strong ISTOCKPHOTOS Accelerate We Mean Business > Soon, millennials will outnumber baby boomers in the workplace. Here's how both generations can adjust—and thrive. By Br ittany Shoot J ulia Ritchey learns a lot from her baby boomer colleagues, especially those she oversees. Ritchey is a mil- lennial and the managing editor of KUER 90.1 FM, National Public Radio (NPR), in Utah. She manages a team of seven, two of whom she believes are boomers. Boomers (those born between roughly 1946 and 1964) are stereotyped as rigid and tech illiterate, while millennials (born between 1981 and 1997) are labeled as obsessed with their smartphones and entitled. ese two groups are often de- scribed as having temperaments and pri- orities too disparate to understand each other. ough she's younger than many of her colleagues, including professionals she manages, Ritchey hasn't encoun- tered any scenarios in which different sensibilities or work styles have caused conflict. If anything, she's learned a great deal from her colleagues. "e boomers I oversee chose not to climb the rungs of Here Come the Millennials role models, either because they don't have the juice to control outcomes or because they advance so quickly that they do not have the ability to relate to those who have struggled. • Younger workers are used to working longer workweeks and are perceived as insensitive when boomers resist. • Younger leaders are perceived to lack strategic perspective and not be ca- pable of presenting the company in an external meeting. Positive perceptions of millennials: • Younger leaders are more nimble and welcome change. • Younger leaders have greater ability to inspire and excite their team. • Younger workers are more willing to challenge the status quo and work for continual improvement. • Younger workers are more focused on results. • Younger workers are good at setting stretch goals.